Thomson Reuters would like to announce some changes to the managing editorial team for the Australian Tax Review. Professor Chris Evans has recently stepped down as General Editor, and has joined the journal’s Editorial Board. Thomson Reuters would like to thank Chris for his contribution to the journal in his role as General Editor, which he has held since 2003. His dedication and commitment has ensured the journal continues to be the foremost refereed tax journal in Australia. We warmly welcome Professor Kerrie Sadiq and Professor Dale Pinto as co-General Editors. 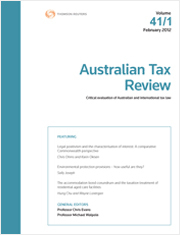 Kerrie and Chris joined the Australian Tax Review as Associate Editors in February 2015, and have been assisting Chris in the management of the journal during this time. We wish Kerrie and Dale all the best as they continue the hard work Chris has done to ensure that the journal continues to provide high quality and in-depth analysis and critique of Australian domestic and international tax law.